Barcode Scanner - Laser Gun "Hand-Held"
The Newsagency POS System - "Package M" Newsagency offers maximum capacity and flexibility. The user friendly POS touch screen can have an almost unlimited number of items preset for 'one touch registration'. A physical keyboard for POS transactions is not required as any manually entered prices or product searches can be done via the on-screen keyboard (touch screen). 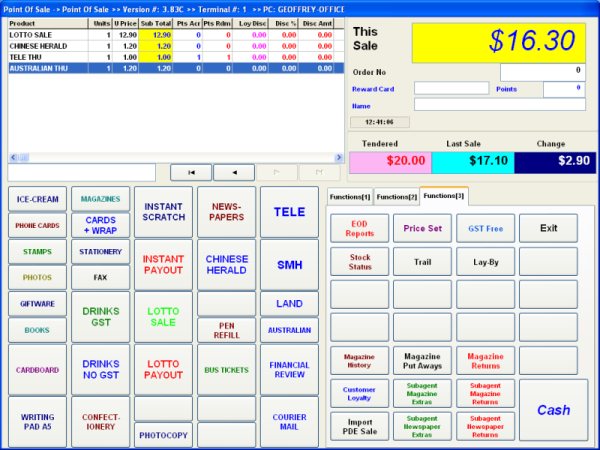 Over and above a standard Cash Register; Newsagency POS System - "Package B" offers complete magazine management with "electronic" returns, customer accounts with monthly statements, supplier "electronic" invoice entry, "Specials" Pricing by Preset Start / Stop Date Range, extensive sales reporting over any given date range, an optional full 'Customer Screen Display' for detailing a customer's purchase along with visual in-store promotional advertisements, complete back office functionality and more. 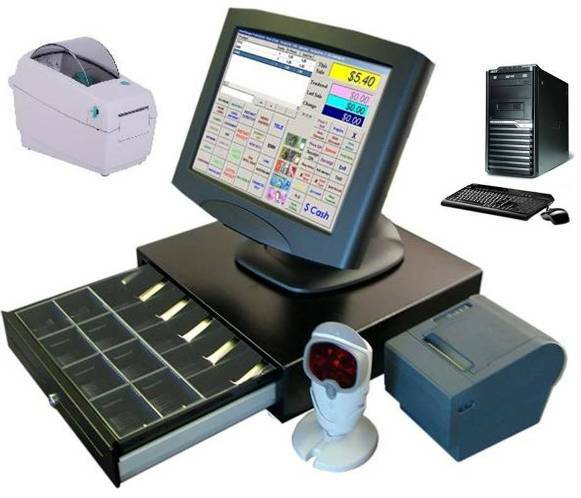 Optional POS hardware such as EFTPOS, Scales, Scanners, Other POS Terminals and Computers, Customer Pole or Screen Displays and more can be added. Perfect for a small to medium sized newsagency. Combines complete POS functionality, including barcode scanning with Magazine Management. Receive "electronic" invoices and perform magazine returns for Gordon & Gotch, Network Services & Fairfax (Integrated Publication Solutions - IPS) via XchangeIT on either your POS Terminal or Back Office PC. 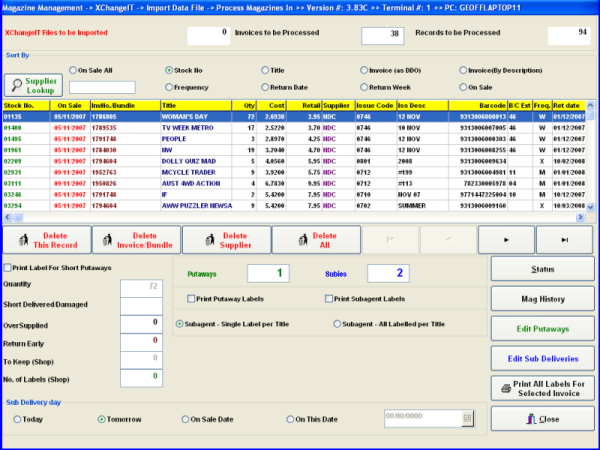 The feature list of the Newsagency POS System - "Package M" (POS & XchangeIT & Office PC) is extensive. Some of the main features are listed below. Initial Programming and setup is included in the price (Receipt Header, System Options & "Master" Newsagency Product Database). After your purchase, an Access POS representative will contact you to discuss the various programming options prior to freighting the POS System - "Package M" (POS & XchangeIT & Office PC). PROSPA PAY Buy over 13 weekly payments of $ 638.08 (ex. GST). No Interest ever and No Fees if you pay on time. Contact Prospa Pay online at PROSPA PAY or call 1300 706 983 for a simple over the phone application. No obligation. SILVER CHEF Rent-Try-Buy. Rent from $ 105.28 (ex. GST) per week for a minimum of 12 months before you decide to either Buy (with 75% of prepaid rental being deducted from the original cash price), Upgrade or Return at no further obligation. Apply online at SILVER CHEF or call 1800 337 153 for a simple over the phone application. No obligation. Synopsis: Rosemeadow Newsagency & Post Office, located in the south - west suburbs of Sydney, recently installed the Access POS "Newsagency POS System" replacing an outdated competitor's newsagency POS System. Although we live in a world of "Business is Business", it was of great pleasure to receive a Thank You card with enclosed lotto tickets posted to us expressing their gratitude for the support Access POS has provided in assisting them with the implementation of their new POS System. Synopsis: Access POS is still busy installing it's Newsagency POS System right up to the last minutes of Christmas Eve. 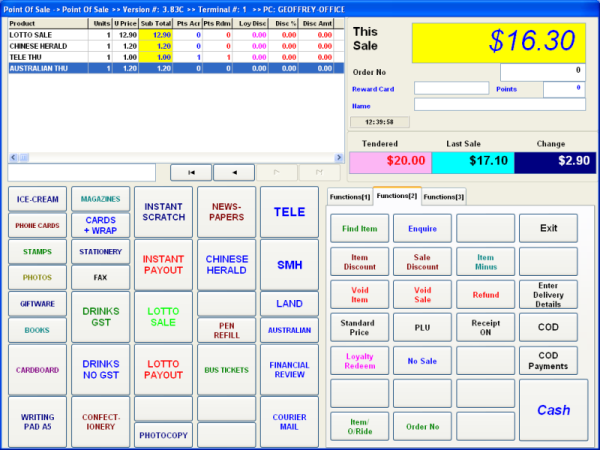 Synopsis: Access POS is experiencing a large increase in sales of it's Newsagency POS System. A further up-swing is expected post 1 July 2012 when the new generous small business depreciation allowances are introduced. Synopsis: The Access POS Software has once again been confirmed by XchangeIT as fully compliant when it comes to newsagent magazine management in regards to facilitating all types of returns (early, normal & late) via its POS Software as three separate files instead of a single returns file. This allows newsagents to accurately process their returns at any time. This is especially relevant in the case of early returns. 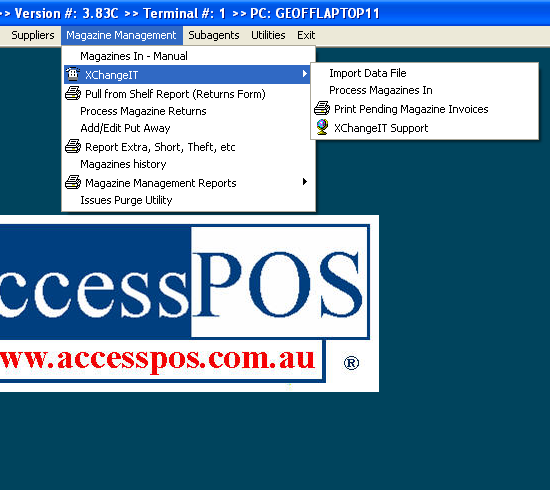 Synopsis: The Access POS Software is the only supplier of Newsagency POS Software that has 100% XchangeIT file Integrity. To help move more Australian Newsagents into industry compliant Newsagency Software, Access POS will promote a special offer next week to newsagents currently using the Tower Systems Software as well as the now defunct NewsPOS Software Company, to help them switch to 100% file integrity compliant Newsagency POS Software. Synopsis: Tower Systems Newsagency Software users can contact us to get help in upgrading to the Access POS Newsagency System. 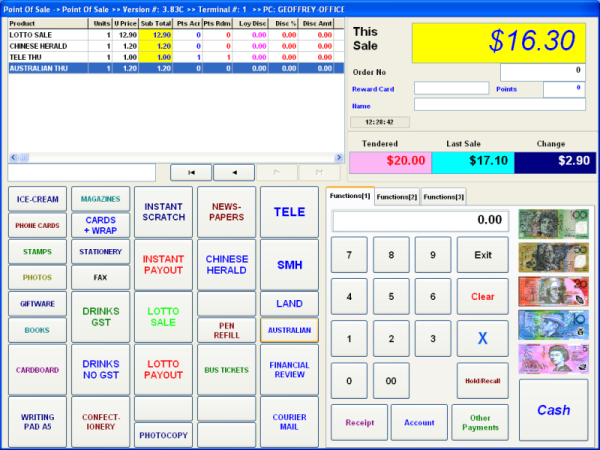 Synopsis: Tower Systems Newsagency POS Software users are upgrading their computer POS Systems to the up-to-date Access POS Newsagency POS System. Synopsis: Victoria Square Newsagency, centrally located in Adelaide, South Australia, recently installed the Access POS "Newsagency POS System" replacing their outdated cash register. Although we live in a world of "Business is Business", it was of great pleasure to receive a Thank You card posted to us expressing their gratitude for the support Access POS has provided in assisting them with the implementation of their new POS System. Synopsis: Access POS is pleased to announce that our newsagency POS customers will be the first to receive electronic magazine invoices from Fairfax who have taken over the distributorship of many magazine titles after the demise NDD Distribtion. 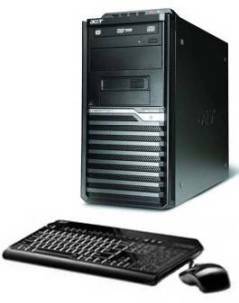 Any warranty enquiries can be either directed to Access POS Pty Ltd or Acer Australia. Nick, I thank you yet again.